Beaumont Terrace does not allow smoking in any common areas, and within 25 feet of the building. Beaumont is home to the annual Cherry Festival in June. This area is nestled in a valley surrounded by fruit orchards and mountains. Located at a 2700 feet elevation, the area has moderate temperatures in the summers and winters. Residents enjoy country style living, antique shops and sidewalk cafes all within walking distance of the building. 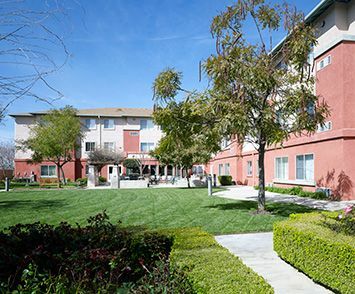 The apartments surround a lush and beautifully manicured courtyard where residents enjoy vegetable gardens, fruit trees and a beautiful rose garden. The building has an enclosed dog park for resident pets to enjoy. The location is near a casino and the Cabazon discount shopping malls. In addition, the residents enjoy visiting with each other, cards, bingo, BBQ's and parties. Beaumont Towers Co-op was also nationally recognized as “A Community of Quality” by the National Affordable Housing Management Association in 2011. Included in this Senior PRAC property is rent are heat, A/C and utility allowance. Beaumont Terrace Co-op is proud to be recognized as a NAHMA Communities of Quality Corporate Partner. This designation is for multifamily properties that have achieved a high standard of excellence in the way they are managed, the services they provide residents, the experience and training of personnel, and other criteria.